When Is Thanksgiving Most Likely To Happen? I thought I had written this up. Which is good because I didn’t want to spend the energy redoing these calculations. The date of Thanksgiving, as observed in the United States, is that it’s the fourth Thursday of November. So it might happen anytime from the 22nd through the 28th. But because of the quirks of the Gregorian calendar, it can happen that a particular date, like the 23rd of November, is more or less likely to be a Thursday than some other day of the week. So here’s the results of what days are most and least likely to be Thanksgiving. It turns out the 23rd, this year’s candidate, is tied for the rarest of Thanksgiving days. It’s not that rare, in comparison. It happens only two fewer times every 400 years than do Thanksgivings on the 22nd of November, the (tied) most common day. Author Joseph NebusPosted on Tuesday, 21 November, 2017 Tuesday, 21 November, 2017 Categories Math, Mathematics, Maths, ProbabilityTags calendars, holidays, Thanksgiving2 Comments on When Is Thanksgiving Most Likely To Happen? If I’d started pondering the question a week earlier I’d have a nice timely post. Too bad. Shouldn’t wait nearly a year to use this one, though. My love and I got talking about early and late Easters. We know that we’re all but certainly not going to be alive to see the earliest possible Easter, at least not unless the rule for setting the date of Easter changes. Easter can be as early as the 22nd of March or as late as the 25th of April. Nobody presently alive has seen a 22nd of March Easter; the last one was in 1818. Nobody presently alive will; the next will be 2285. The last time Easter was its latest date was 1943; the next time will be 2038. I know people who’ve seen the one in 1943 and hope to make it at least through 2038. But that invites the question: what dates are most likely to be Easter? What ones are least? In a sense the question is nonsense. The rules establishing Easter and the Gregorian calendar are known. To speak of the “chance” of a particular day being Easter is like asking the probability that Grover Cleveland was president of the United States in 1894. Technically there’s a probability distribution there. But it’s different in some way from asking the chance of rolling at least a nine on a pair of dice. When we’ve got that, though, we can tackle the problem. We could do as I did for working out what days are most likely to be Thanksgiving. Run through all the possible configurations of the calendar, tally how often each of the days in the range is Easter, and see what comes up most often. There’s a hassle here. Working out the date of Easter follows a rule, yes. The rule is that it’s the first Sunday after the first full moon after the spring equinox. There are wrinkles, mostly because the Moon is complicated. A notional Moon that’s a little more predictable gets used instead. There are algorithms you can use to work out when Easter is. They all look like some kind of trick being used to put something over on you. No matter. They seem to work, as far as we know. I found some Matlab code that uses the Easter-computing routine that Karl Friedrich Gauss developed and that’ll do. Problem. The Moon and the Earth follow cycles around the sun, yes. Wait long enough and the positions of the Earth and Moon and Sun. This takes 532 years and is known as the Paschal Cycle. In the Julian calendar Easter this year is the same date it was in the year 1485, and the same it will be in 2549. It’s no particular problem to set a computer program to run a calculation, even a tedious one, 532 times. But it’s not meaningful like that either. The problem is the Julian calendar repeats itself every 28 years, which fits nicely with the Paschal Cycle. The Gregorian calendar, with different rules about how to handle century years like 1900 and 2100, repeats itself only every 400 years. So it takes much longer to complete the cycle and get Earth, Moon, and calendar date back to the same position. To fully account for all the related cycles would take 5,700,000 years, estimates Duncan Steel in Marking Time: The Epic Quest To Invent The Perfect Calendar . Write code to calculate Easter on a range of years and you can do that, of course. It’s no harder to calculate the dates of Easter for six million years than it is for six hundred years. It just takes longer to finish. The problem is that it is meaningless to do so. Over the course of a mere(!) 26,000 years the precession of the Earth’s axes will change the times of the seasons completely. If we still use the Gregorian calendar there will be a time that late September is the start of the Northern Hemisphere’s spring, and another time that early February is the heart of the Canadian summer. Within five thousand years we will have to change the calendar, change the rule for computing Easter, or change the idea of it as happening in Europe’s early spring. To calculate a date for Easter of the year 5,002,017 is to waste energy. We probably don’t need it anyway, though. The differences between any blocks of 532 years are, I’m going to guess, minor things. I would be surprised if the frequency of any date’s appearance changed more than a quarter of a percent. That might scramble the rankings of dates if we have several nearly-as-common dates, but it won’t be much. So let me do that. Here’s a table of how often each particular calendar date appears as Easter from the years 2000 to 5000, inclusive. And I don’t believe that by the year we would call 5000 we’ll still have the same calendar and Easter and expectations of Easter all together, so I’m comfortable overlooking that. Indeed, I expect we’ll have some different calendar or Easter or expectation of Easter by the year 4985 at the latest. 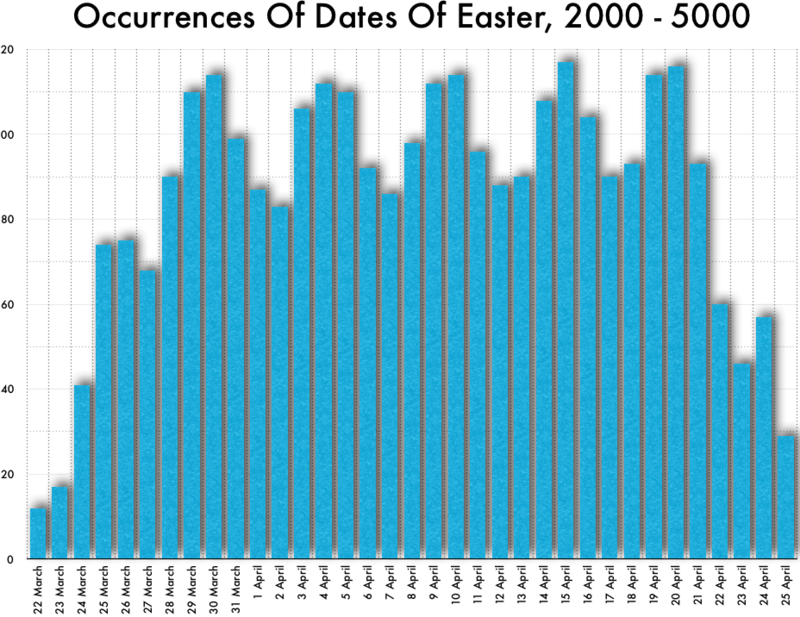 Dates of Easter from 2000 through 5000. Computed using Gauss’s algorithm. If I haven’t missed anything, this indicates that the 15th of April is the most likely date for Easter, with the 20th close behind and the 10th and 14th hardly rare. The least probable date is the 22nd of March, with the 23rd of March and the 25th of April almost as unlikely. 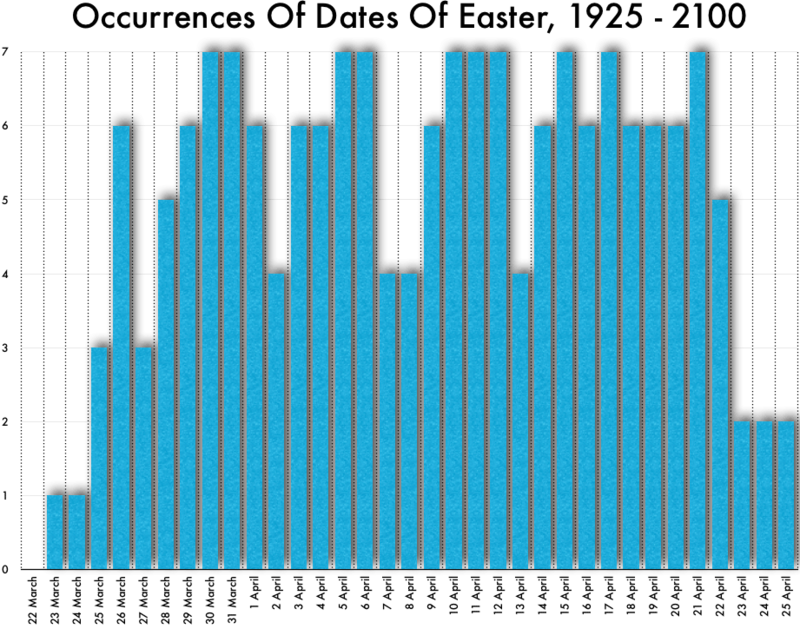 Dates of Easter from 1925 through 2100. Computed using Gauss’s algorithm. If we take this as the “working lifespan” of our common experience then the 22nd of March is the least likely Easter we’ll see, as we never do. The 23rd and 24th are the next least likely Easter. There’s a ten-way tie for the most common date of Easter, if I haven’t missed one or more. But the 30th and 31st of March, and the 5th, 6th, 10th, 11th, 12th, 15th, 17th, and 21st of April each turn up seven times in this range. The Julian calendar Easter dates are different and perhaps I’ll look at that sometime. Author Joseph NebusPosted on Tuesday, 18 April, 2017 Tuesday, 18 April, 2017 Categories Math, Mathematics, Maths, ProbabilityTags calendars, Duncan Steel, Easter, Gregorian calendar, Karl Friedrich Gauss6 Comments on What Is The Most Probable Date For Easter? What Is The Least? September 1999 was a heck of a month you maybe remember. There that all that excitement of the Moon being blasted out of orbit thanks to the nuclear waste pile up there getting tipped over or something. And that was just as we were getting over the final new episode of Mystery Science Theater 3000 ‘s first airing. That episode was number 1003, Merlin’s Shop of Mystical Wonders, which aired a month after the season finale because of one of those broadcast rights tangles that the show always suffered through. Time moves on, and strange things happen, and show co-creator and first host Joel Hodgson got together a Kickstarter and a Netflix deal. The show’s Season Eleven is supposed to air starting the 14th of April, this year. The natural question: how long will we go, then, between new episodes of Mystery Science Theater 3000 ? Or more generally, how do you work out how long it is between two dates? So my answer is don’t ever try to work this out yourself. Never. Just refuse the problem if you’re given it. If you’re a consultant charge an extra hundred dollars for even hearing the problem. All right, but what if you really absolutely must know for some reason? I only know one good answer. Convert the start and the end dates of your interval into Julian Dates and subtract one from the other. I mean subtract the smaller number from the larger. Julian Dates are one of those extremely minor points of calendar use. They track the number of days elapsed since noon, Universal Time, on the Julian-calendar date we call the 1st of January, 4713 BC. The scheme, for years, was set up in 1583 by Joseph Justus Scalinger, calendar reformer, who wanted for convenience an index year so far back that every historically known event would have a positive number. In the 19th century the astronomer John Herschel expanded it to date-counting. Scalinger picked the year from the convergence of a couple of convenient calendar cycles about how the sun and moon move as well as the 15-year indiction cycle that the Roman Empire used for tax matters (and that left an impression on European nations). His reasons don’t much matter to us. The specific choice means we’re not quite three-fifths of the way through the days in the 2,400,000’s. So it’s not rare to modify the Julian Date by subtracting 2,400,000 from it. The date starts from noon because astronomers used to start their new day at noon, which was more convenient for logging a whole night’s observations. Since astronomers started taking pictures of stuff and looking at them later they’ve switched to the new day starting at midnight like everybody else, but you know what it’s like changing an old system. This summons the problem: so how do I know many dates passed between whatever day I’m interested in and the Julian Calendar 1st of January, 4713 BC? Yes, there’s a formula. No, don’t try to use it. Let the fine people at the United States Naval Observatory do the work for you. They know what they’re doing and they’ve had this calculator up for a very long time without any appreciable scandal accruing to it. The system asks you for a time of day, because the Julian Date increases as the day goes on. You can just make something up if the time doesn’t matter. I normally leave it on midnight myself. So. The last episode of Mystery Science Theater 3000 to debut, on the 12th of September, 1999, did so on Julian Date 2,451,433. (Well, at 9 am Eastern that day, but nobody cares about that fine grain a detail.) The new season’s to debut on Netflix the 14th of April, 2017, which will be Julian Date 2,457,857. (I have no idea if there’s a set hour or if it’ll just become available at 12:01 am in whatever time zone Netflix Master Command’s servers are in.) That’s a difference of 6,424 days. You’re on your own in arguing about whether that means it was 6,424 or 6,423 days between new episodes. If you do take anything away from this, though, please let it be the warning: never try to work out the interval between dates yourself. So my question from last Thursday nagged at my mind. And I learned that Octave (a Matlab clone that’s rather cheaper) has a function that calculates the day of the week for any given day. And I spent longer than I would have expected fiddling with the formatting to get what I wanted to know. It turns out there are some days in November more likely to be the fourth Thursday than others are. (This is the current standard for Thanksgiving Day in the United States.) And as I’d suspected without being able to prove, this doesn’t quite match the breakdown of which months are more likely to have Friday the 13ths. That is, it’s more likely that an arbitrarily selected month will start on Sunday than any other day of the week. It’s least likely that an arbitrarily selected month will start on a Saturday or Monday. The difference is extremely tiny; there are only four more Sunday-starting months than there are Monday-starting months over the course of 400 years. I don’t pretend there’s any significance to this. But it is another of those interesting quirks of probability. What you would say the probability is of a month starting on the 1st — equivalently, of having a Friday the 13th, or a Fourth Thursday of the Month that’s the 26th — depends on how much you know about the month. If you know only that it’s a month on the Gregorian calendar it’s one thing (specifically, it’s 688/4800, or about 0.14333). If you know only that it’s a November than it’s another (58/400, or 0.145). If you know only that it’s a month in 2016 then it’s another yet (1/12, or about 0.08333). If you know that it’s November 2016 then the probability is 0. Information does strange things to probability questions. Author Joseph NebusPosted on Thursday, 1 December, 2016 Thursday, 1 December, 2016 Categories Math, Mathematics, Maths, ProbabilityTags calendars, Friday the 13th, Gregorian calendar, Matlab, November, Thanksgiving1 Comment on When Is Thanksgiving Most Likely To Happen? It’s well-known, at least in calendar-appreciation circles, that the 13th of a month is more likely to be Friday than any other day of the week. That’s on the Gregorian calendar, which has some funny rules about whether a century year — 1900, 2000, 2100 — will be a leap year. Three of them aren’t in every four centuries. The result is the pattern of dates on the calendar is locked into this 400-year cycle, instead of the 28-year cycle you might imagine. And this makes some days of the week more likely for some dates than they otherwise might be. This got me wondering. Does the 13th being slightly more likely imply that the United States Thanksgiving is more likely to be on the 26th of the month? The current rule is that Thanksgiving is the fourth Thursday of November. We’ll pretend that’s an unalterable fact of nature for the sake of having a problem we can solve. So if the 13th is more likely to be a Friday than any other day of the week, isn’t the 26th more likely to be a Thursday than any other day of the week? And that’s so, but I’m not quite certain yet. What’s got me pondering this in the shower is that the 13th is more likely a Friday for an arbitrary month. That is, if I think of a month and don’t tell you anything about what it is, all we can say is it chance of the 13th being a Friday is such-and-such. But if I pick a particular month — say, November 2017 — things are different. The chance the 13th of November, 2017 is a Friday is zero. So the chance the 26th of December, 2017 is a Thursday is zero. Our calendar system sets rules. We’ll pretend that’s an unalterable fact of nature for the sake of having a problem we can solve, too. But I would like to know if it can be argued there’s a difference, or that there isn’t. 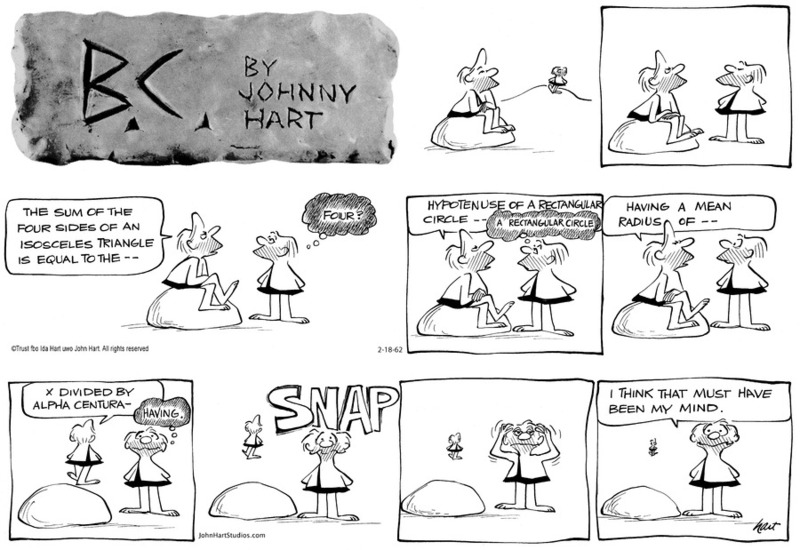 I can’t think of any particular thematic link through the past week’s mathematical comic strips. This happens sometimes. I’ll make do. They’re all Gocomics.com strips this time around, too, so I haven’t included the strips. The URLs ought to be reasonably stable. J C Duffy’s Lug Nuts (August 23) is a cute illustration of the first, second, third, and fourth dimensions. The wall-of-text might be a bit off-putting, especially the last panel. It’s worth the reading. Indeed, you almost don’t need the cartoon if you read the text. Tom Toles’s Randolph Itch, 2 am (August 24) is an explanation of pie charts. This might be the best stilly joke of the week. I may just be an easy touch for a pie-in-the-face. Charlie Podrebarac’s Cow Town (August 26) is about the first day of mathematics camp. It’s also every graduate students’ thesis defense anxiety dream. The zero with a slash through it popping out of Jim Smith’s mouth is known as the null sign. That comes to us from set theory, where it describes “a set that has no elements”. Null sets have many interesting properties considering they haven’t got any things. And that’s important for set theory. The symbol was introduced to mathematics in 1939 by Nicholas Bourbaki, the renowned mathematician who never existed. He was important to the course of 20th century mathematics. Eric the Circle (August 26), this one by ‘Arys’, is a Venn diagram joke. It makes me realize the Eric the Circle project does less with Venn diagrams than I expected. John Graziano’s Ripley’s Believe It Or Not (August 26) talks of a Akira Haraguchi. If we believe this, then, in 2006 he recited 111,700 digits of pi from memory. It’s an impressive stunt and one that makes me wonder who did the checking that he got them all right. The fact-checkers never get their names in Graziano’s Ripley’s. Mark Parisi’s Off The Mark (August 27, rerun from 1987) mentions Monty Hall. This is worth mentioning in these parts mostly as a matter of courtesy. The Monty Hall Problem is a fine and imagination-catching probability question. It represents a scenario that never happened on the game show Let’s Make A Deal , though. Jeff Stahler’s Moderately Confused (August 28) is a word problem joke. I do wonder if the presence of battery percentage indicators on electronic devices has helped people get a better feeling for percentages. I suppose only vaguely. The devices can be too strangely nonlinear to relate percentages of charge to anything like device lifespan. I’m thinking here of my cell phone, which will sit in my messenger bag for three weeks dropping slowly from 100% to 50%, and then die for want of electrons after thirty minutes of talking with my father. I imagine you have similar experiences, not necessarily with my father. Thom Bluemel’s Birdbrains (August 29) is a caveman-mathematics joke. This one’s based on calendars, which have always been mathematical puzzles. I’ve got enough comics to do a mathematics-comics roundup post again, but none of them are the King Features or Creators or other miscellaneous sources that demand they be included here in pictures. I could wait a little over three hours and give the King Features Syndicate comics another chance to say anything on point, or I could shrug and go with what I’ve got. It’s a tough call. Ah, what the heck; besides, it’s been over a week since I did the last one of these. Bill Amend’s FoxTrot (December 7)	bids to get posted on mathematics teachers’ walls with a bit of play on two common uses of the term “degree”. It’s also natural to wonder why the same word “degree” should be used to represent the units of temperature and the size of an angle, to the point that they even use the same symbol of a tiny circle elevated from the baseline as a shorthand representation. As best I can make out, the use of the word degree traces back to Old French, and “degré”, meaning a step, as in a stair. In Middle English this got expanded to the notion of one of a hierarchy of steps, and if you consider the temperature of a thing, or the width of an angle, as something that can be grown or shrunk then … I’m left wondering if the Middle English folks who extended “degree” to temperatures and angles thought there were discrete steps by which either quantity could change. Mark Litzer’s Joe Vanilla (December 7)	uses a panel of calculus to suggest something particularly deep or intellectually challenging. As it happens, the problem isn’t quite defined well enough to solve, but if you make a reasonable assumption about what’s meant, then it becomes easy to say: this expression is “some infinitely large number”. Here’s why. The numerator is the integral . You can think of the integral of a positive-valued expression as the area underneath that expression and between the lines marked by, on the left, (the number on the bottom of the integral sign), and on the right, (the number on the top of the integral sign). (You know that it’s x because the integral symbol ends with “dx”; if it ended “dy” then the integral would tell you the left and the right bounds for the variable y instead.) Now, is a number that depends on x, yes, but which is never smaller than (about 23.14) nor bigger than (about 24.14). So the area underneath this expression has to be at least as big as the area within a rectangle that’s got a bottom edge at y = 0, a top edge at y = 23, a left edge at x = 0, and a right edge at x infinitely far off to the right. That rectangle’s got an infinitely large area. The area underneath this expression has to be no smaller than that. Just because the numerator’s infinitely large doesn’t mean that the fraction is, though. It’s imaginable that the denominator is also infinitely large, and more wondrously, is large in a way that makes the ratio some more familiar number like “3”. Spoiler: it isn’t. Actually, as it is, the denominator isn’t quite much of anything. It’s a summation; that’s what the capital sigma designates there. By convention, the summation symbol means to evaluate whatever expression there is to the right of it — in this case, it’s — for each of a series of values of some index variable. That variable is normally identified underneath the sigma, with a line such as x = 1, and (again by convention) for x = 2, x = 3, x = 4, and so on, until x equals whatever the number on top of the sigma is. In this case, the bottom doesn’t actually say what the index should be, although since “x” is the only thing that makes sense as a variable within the expression — “cos” means the cosine function, and “e” means the number that’s about 2.71828 unless it’s otherwise made explicit — we can suppose that this is a normal bit of shorthand like you use when context is clear. With that assumption about what’s meant, then, we know the denominator is whatever number is represented by (and 1/e is about 0.368). That’s a number about 16.549, which falls short of being infinitely large by an infinitely large amount. So, the original fraction shown represents an infinitely large number. Mark Tatulli’s Lio (December 7)	is another “anthropomorphic numbers” genre comic, and since it’s Lio the numbers naturally act a bit mischievously. Greg Evans’s Luann Againn (December 7, I suppose technically a rerun)	only has a bit of mathematical content, as it’s really playing more on short- and long-term memories. Normal people, it seems, have a buffer of something around eight numbers that they can remember without losing track of them, and it’s surprisingly easy to overload that. I recall reading, I think in Joseph T Hallinan’s Why We Make Mistakes: How We Look Without Seeing, Forget Things In Seconds, And Are All Pretty Sure We are Way Above Average, and don’t think I’m not aware of how funny it would be if I were getting this source wrong, that it’s possible to cheat a little bit on the size of one’s number-buffer. Hallinan (?) gave the example of a runner who was able to remember strings of dozens of numbers, well past the norm, but apparently by the trick of parsing numbers into plausible running times. That is, the person would remember “834126120820” perfectly because it could be expressed as four numbers, “8:34, 1:26, 1:20, 8:20”, that might be credible running times for something or other and the runner was used to remembering such times. Supporting the idea that this trick was based on turning a lot of digits into a few small numbers was that the runner would be lost if the digits could not be parsed into a meaningful time, like, “489162693077”. So, in short, people are really weird in how they remember and don’t remember things. Harley Schwadron’s 9 to 5 (December 8)	is a “reluctant student” question who, in the tradition of kids in comic strips, tosses out the word “app” in the hopes of upgrading the action into a joke. I’m sympathetic to the kid not wanting to do long division. In arithmetic the way I was taught it, this was the first kind of problem where you pretty much had to approximate and make a guess what the answer might be and improve your guess from that starting point, and that’s a terrifying thing when, up to that point, arithmetic has been a series of predictable, discrete, universally applicable rules not requiring you to make a guess. It feels wasteful of effort to work out, say, what seven times your divisor is when it turns out it’ll go into the dividend eight times. I am glad that teaching approaches to arithmetic seem to be turning towards “make approximate or estimated answers, and try to improve those” as a general rule, since often taking your best guess and then improving it is the best way to get a good answer, not just in long division, and the less terrifying that move is, the better. Justin Boyd’s Invisible Bread (December 12)	reveals the joy and the potential menace of charts and graphs. It’s a reassuring red dot at the end of this graph of relevant-graph-probabilities. Several comics chose to mention the coincidence of the 13th of December being (in the United States standard for shorthand dating) 12-13-14. Chip Sansom’s The Born Loser does the joke about how yes, this sequence won’t recur in (most of our) lives, but neither will any other. Stuart Carlson and Jerry Resler’s Gray Matters takes a little imprecision in calling it “the last date this century to have a consecutive pattern”, something the Grays, if the strip is still running, will realize on 1/2/34 at the latest. And Francesco Marciuliano’s Medium Large uses the neat pattern of the dates as a dip into numerology and the kinds of manias that staring too closely into neat patterns can encourage. I’ve got enough mathematics comics for another roundup, and this time, the subjects give me reason to dip into ancient days: one to the most famous, among mathematicians and astronomers anyway, of Greek shipwrecks, and another to some point in the midst of winter nearly seven thousand years ago. Eric the Circle (November 15)	returns “Griffinetsabine” to the writer’s role and gives another “Shape Single’s Bar” scene. I’m amused by Eric appearing with his ex: x is practically the icon denoting “this is an algebraic expression”, while geometry … well, circles are good for denoting that, although I suspect that triangles or maybe parallelograms are the ways to denote “this is a geometric expression”. Maybe it’s the little symbol for a right angle. Jim Meddick’s Monty (November 17)	presents Monty trying to work out just how many days there are to Christmas. This is a problem fraught with difficulties, starting with the obvious: does “today” count as a shopping day until Christmas? That is, if it were the 24th, would you say there are zero or one shopping days left? Also, is there even a difference between a “shopping day” and a “day” anymore now that nobody shops downtown so it’s only the stores nobody cares about that close on Sundays? Sort all that out and there’s the perpetual problem in working out intervals between dates on the Gregorian calendar, which is that you have to be daft to try working out intervals between dates on the Gregorian calendar. The only worse thing is trying to work out the intervals between Easters on it. My own habit for this kind of problem is to use the United States Navy’s Julian Date conversion page. The Julian date is a straight serial number, counting the number of days that have elapsed since noon Universal Time at what’s called the 1st of January, 4713 BCE, on the proleptic Julian calendar (“proleptic” because nobody around at the time was using, or even imagined, the calendar, but we can project back to what date that would have been), a year picked because it’s the start of several astronomical cycles, and it’s way before any specific recordable dates in human history, so any day you might have to particularly deal with has a positive number. Of course, to do this, we’re transforming the problem of “counting the number of days between two dates” to “counting the number of days between a date and January 1, 4713 BCE, twice”, but the advantage of that is, the United States Navy (and other people) have worked out how to do that and we can use their work. Bill Hind’s kids-sports comic Cleats (November 19, rerun)	presents Michael offering basketball advice that verges into logic and set theory problems: making the ball not go to a place outside the net is equivalent to making the ball go inside the net (if we decide that the edge of the net counts as either inside or outside the net, at least), and depending on the problem we want to solve, it might be more convenient to think about putting the ball into the net, or not putting the ball outside the net. We see this, in logic, in a set of relations called De Morgan’s Laws (named for Augustus De Morgan, who put these ideas in modern mathematical form), which describe what kinds of descriptions — “something is outside both sets A and B at one” or “something is not inside set A or set B”, or so on — represent the same relationship between the thing and the sets. Tom Thaves’s Frank and Ernest (November 19)	is set in the classic caveman era, with prehistoric Frank and Ernest and someone else discovering mathematics and working out whether a negative number times a negative number might be positive. It’s not obvious right away that they should, as you realize when you try teaching someone the multiplication rules including negative numbers, and it’s worth pointing out, a negative times a negative equals a positive because that’s the way we, the users of mathematics, have chosen to define negative numbers and multiplication. We could, in principle, have decided that a negative times a negative should give us a negative number. This would be a different “multiplication” (or a different “negative”) than we use, but as long as we had logically self-consistent rules we could do that. We don’t, because it turns out negative-times-negative-is-positive is convenient for problems we like to do. Mathematics may be universal — something following the same rules we do has to get the same results we do — but it’s also something of a construct, and the multiplication of negative numbers is a signal of that. The Mickey Mouse comic rerun the 20th of November, 2014. Mickey Mouse (November 20, rerun)	— I don’t know who wrote or draw this, but Walt Disney’s name was plastered onto it — sees messages appearing in alphabet soup. In one sense, such messages are inevitable: jumble and swirl letters around and eventually, surely, any message there are enough letters for will appear. This is very similar to the problem of infinite monkeys at typewriters, although with the special constraint that if, say, the bowl has only two letters “L”, it’s impossible to get the word “parallel”, unless one of the I’s is doing an impersonation. Here, Goofy has the message “buried treasure in back yard” appear in his soup; assuming those are all the letters in his soup then there’s something like 44,881,973,505,008,615,424 different arrangements of letters that could come up. There are several legitimate messages you could make out of that (“treasure buried in back yard”, “in back yard buried treasure”), not to mention shorter messages that don’t use all those letters (“run back”), but I think it’s safe to say the number of possible sentences that make sense are pretty few and it’s remarkable to get something like that. Maybe the cook was trying to tell Goofy something after all. Mark Anderson’s Andertoons (November 20)	is a cute gag about the dangers of having too many axes on your plot. Gary Delainey and Gerry Rasmussen’s Betty (November 20)	mentions the Antikythera Mechanism, one of the most famous analog computers out there, and that’s close enough to pure mathematics for me to feel comfortable including it here. The machine was found in April 1900, in ancient shipwreck, and at first seemed to be just a strange lump of bronze and wood. By 1902 the archeologist Valerios Stais noticed a gear in the mechanism, but since it was believed the wreck far, far predated any gear mechanisms, the machine languished in that strange obscurity that a thing which can’t be explained sometimes suffers. The mechanism appears to be designed to be an astronomical computer, tracking the positions of the Sun and the Moon — tracking the actual moon rather than an approximate mean lunar motion — the rising and etting of some constellations, solar eclipses, several astronomical cycles, and even the Olympic Games. It’s an astounding mechanism, it’s mysterious: who made it? How? Are there others? What happened to them? How was the mechanical engineering needed for this developed, and what other projects did the people who created this also do? Any answers to these questions, if we ever know them, seem sure to be at least as amazing as the questions are. The stream of mathematics-trivia tweets brought to my attention that the 12th of March, 1685 , was the birthday of George Berkeley, who’d become the Bishop of Cloyne and be an important philosopher, and who’s gotten a bit of mathematical immortality for complaining about calculus. Granted everyone who takes it complains about calculus, but Berkeley had the good sorts of complaints, the ones that force people to think harder and more clearly about what they’re doing. Berkeley — whose name I’m told by people I consider reliable was pronounced “barkley” — particularly protested the “fluxions” of calculus as it was practiced in the day in his 1734 tract The Analyst: Or A Discourse Addressed To An Infidel Mathematician, which as far as I know nobody I went to grad school with ever read either, so maybe you shouldn’t bother reading what I have to say about them. Fluxions were meant to represent infinitesimally small quantities, which could be added to or subtracted from a number without changing the number, but which could be divided by one another to produce a meaningful answer. That’s a hard set of properties to quite rationalize — if you can add something to a number without changing the number, you’re adding zero; and if you’re dividing zero by zero you’re not doing division anymore — and yet calculus was doing just that. For example, if you want to find the slope of a curve at a single point on the curve you’d take the x- and y-coordinates of that point, and add an infinitesimally small number to the x-coordinate, and see how much the y-coordinate has to change to still be on the curve, and then divide those changes, which are too small to even be numbers, and get something out of it. It works, at least if you’re doing the calculations right, and Berkeley supposed that it was the result of multiple logical errors cancelling one another out that they did work; but he termed these fluxions with spectacularly good phrasing “ghosts of departed quantities”, and it would take better than a century to put all his criticisms quite to rest. The result we know as differential calculus. I should point out that it’s not as if mathematicians playing with their shiny new calculus tools were being irresponsible in using differentials and integrals despite Berkeley’s criticisms. Mathematical concepts work a good deal like inventions, in that it’s not clear what is really good about them until they’re used, and it’s not clear what has to be made better until there’s a body of experience working with them and seeing where the flaws. And Berkeley was hardly being unreasonable for insisting on logical rigor in mathematics. Berkeley was born in Ireland. I have found it surprisingly hard to get a clear answer about when Ireland switched from the Julian to the Gregorian calendar, so I have no idea whether this birthdate is old style or new style, and for that matter whether the 1685 represents the civil year or the historical year. Perhaps it suffices to say that Berkeley was born sometime around this time of year, a long while ago. I haven’t been able to avoid people on my Twitter feed pointing out today’s a Pythagorean Triple, if you write out the month and day as digits and only use the last two digits of the year. There aren’t many such days; if I haven’t missed one there’s only fourteen per century, and we’ve just burned through the tenth of them. But if you want to have a little fun you might try working out whether I’m correct, and when the next one is going to be. I don’t know of an efficient way of doing this, the sort of thing where you set up a couple of equations and let your favorite version of Mathematica grind away a bit and spit out an array of dates. This seems like the sort of problem best done by working out sets of integers a, b, and c, where , and figure out what sets of those numbers can plausibly even be arranged as dates. The more mysterious thing to me is that I don’t remember this being so much pointed out when we had the same Pythagorean Triple day in May, and not at all when we were really rich with them back nearly a decade ago. But I wasn’t on Twitter back then; maybe that’s the problem. I also haven’t seen people complaining that it’s a trivial thing not worth pointing out; it may be trivial, but if we aren’t going to enjoy pretty alignments of numbers, what are we supposed to do? It must have been the summer vacation making comic strip artists take time off from mathematics-themed jokes: there’s a fresh batch of them a mere ten days after my last roundup. John Zakour and Scott Roberts’s Maria’s Day (September 12) tells the basic “not understanding fractions” joke. I suspect that Zakour and Roberts — who’re pretty well-steeped in nerd culture, as their panel strip Working Daze shows — were summoning one of those warmly familiar old jokes. Well, Sydney Harris got away with the same punch line; why not them? Brett Koth’s Diamond Lil (September 14) also mentions fractions, but as an example of one of those inexplicably complicated mathematics things that’ll haunt you rather than be useful or interesting or even understandable. I choose not to be offended by this insult of my preferred profession and won’t even point out that Koth totally redrew the panel three times over so it’s not a static shot of immobile talking heads.